Welcome to the Holiday Inn Express Andrews Air Force Base. Travelers looking for a hotel deal close to Washington, D.C. will love our location. This suburban Washington hotel is only 1.5 miles from Andrews Air Force Base, home of Air Force One. We're situated in the southern part of Prince George County, convenient to Washington, D.C. and all it has to offer. Business travelers can enjoy our proximity to Boeing, Lockheed Martin, Bolling A.F.B. and the Anacostia Naval Station. 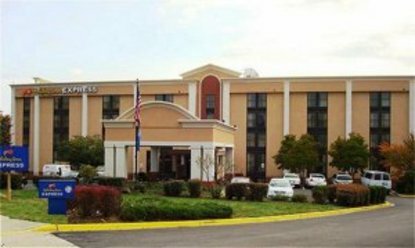 With easy access to the Beltway's I-95/495, our Camp Springs, Maryland, hotel makes it easy to get to nearby Ronald Reagan Airport (DCA). Both Dulles Airport (IAD) and T. Marshall Airport (BWI) are half an hour away. Leisure travelers will appreciate our Camp Springs hotel location. This D.C. hotel is within walking distance of the Branch Avenue Metro Station. This makes touring quicker and more convenient. Major attractions like the White House, the Smithsonian's Museums and the National Mall are just 10 miles away and accessible by the Metro. Just off the Beltway, our D.C. accommodations make travel by car quick and easy. This Andrews Air Force Base hotel features high-speed, wired and wireless Internet access. You can maintain your daily routine by utilizing the on-site Fitness Center or swimming pool. Book your D.C. hotel reservations now and enjoy the convenient location of our Holiday Inn Express Andrews Air Force Base hotel. This hotel is committed to providing accessible facilities under the American Disabilities Act. If your accessibility needs are not met, please contact the Hotel Manager on Duty. Should you require additional information regarding accessible facilities for guests with disabilities, please call 1-800-Holiday (U.S. and Canada) or contact the hotel directly. For the hearing impaired, TDD service is available at 1-800-238-5544 within the U.S. and Canada.